This is an interesting report on the confusing world of marketing email providers. Small- and mid-sized companies now can afford many of the bells and whistles that have driven enterprise-level email marketing programs, according to researchers at VentureBeat. The trick now is to find the platform that is the right fit. "The rich features of typical enterprise solutions are moving downstream and becoming more available for marketers at much lower price points, depending how big your customer list is," Jon Cifuentes, a research analyst at VentureBeat, told FierceCMO. "There's a lot of confusion in the market here in general." VentureBeat released a guide this week to help purchasers of email marketing technology navigate the changing marketplace. The report profiles providers such as Adestra, Constant Contact, Hubspot and Mailjet, who reported concentrations of B2B clients. That's a good place for B2B software buyers to start, Cifuentes said. But VentureBeat researchers found that only half of the more than 1,000 marketers who participated in their online survey indicated that the features of their chosen software met their objectives. "In general, there's extreme feature parity in a set of tools that, at their core, are used to send many of the hundreds of emails the average consumer or business user receives a day," researchers wrote. 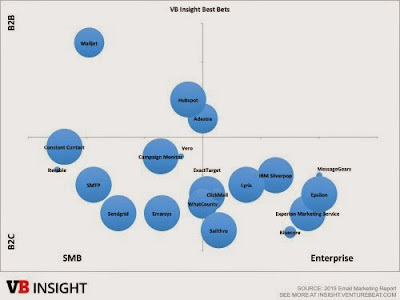 "Vendors check the box on one feature after another, but organizations who are buying these tools tend to be left underwhelmed in new and key areas like mobile device accessibility, analytics and segmentation." Buyer analysis, much like email marketing strategy, has become complex. An estimated $3 billion in investor funding moved into the industry in 2014 alone, according to the report, making it "near impossible to keep up" with change. Companies that are integrating email marketing systems and tagging on additional services where needed—without losing a grasp on the data from these services—are moving in the right direction, according to the report. For B2B marketing technology buyers, this is the trend, Cifuentes said. "B2B is moving more towards the all-in-one, full-featured marketing automation suites to power their email for the marketing use cases better suited for B2B, like lead nurturing. An individual line of business in an enterprise will then tack on MailChimp to do their newsletters."